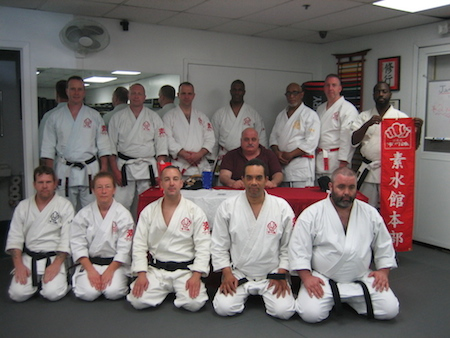 On June 8th, 2014 the Ichikawa-Ha Goju-ryu International Karate-do Sosui kai held its semi-annual gasshuku at the Goshin-Kan dojo in Merrick, NY. The gasshuku was conducted by R. Choji Taiani Kaiso and included members of the hombu dojo, Philadelphia & Nevada branches, as well as special visitors from Maryland and Texas. The Gasshuku opened with a few words from Taiani Kaiso concerning the aims of the day. Taiani Kaiso wanted the participants to understand that he was sharing information with them that he had learned directly from Ichikawa O-Sensei in private. One of the main focuses of the day was Tsuru-Ho Kata which Taiani Kaiso learned in 1976 from Ohtsuka Tadahiko Sensei by request of Ichikawa O-Sensei. Tsuru-Ho translates to “Law of the Crane.” and is one of three crane kata contained in our curriculum. In addition to Tsuro-Ho Kata, a segment of the Gasshuku was dedicated to some of the very devistating Aiki JuJutsu techniques that can be found throughout all of the Goju-ryu Kata. Before beginning Tsuru-Ho Kata, Taiani Kaiso led the group through a rigorous regimen of kihon followed by some finer points to focus on in Sanchin San-Po. It was necessary for all participants to understand the mechanics of Tsuru-Ho before Taiani Kaiso could move on to specific bunkai which he had planned. Shuaiyb Newton Sensei Performing the Opening Technique of Tsuru-Ho. Demonstrates one of the Techniques of the Kata Tsuru-Ho. Jamal El Shihan of the Philadelphia Branch Takes a Knee While Taiani Kaiso Discusses Aiki JuJutsu Techniques Within Kata. 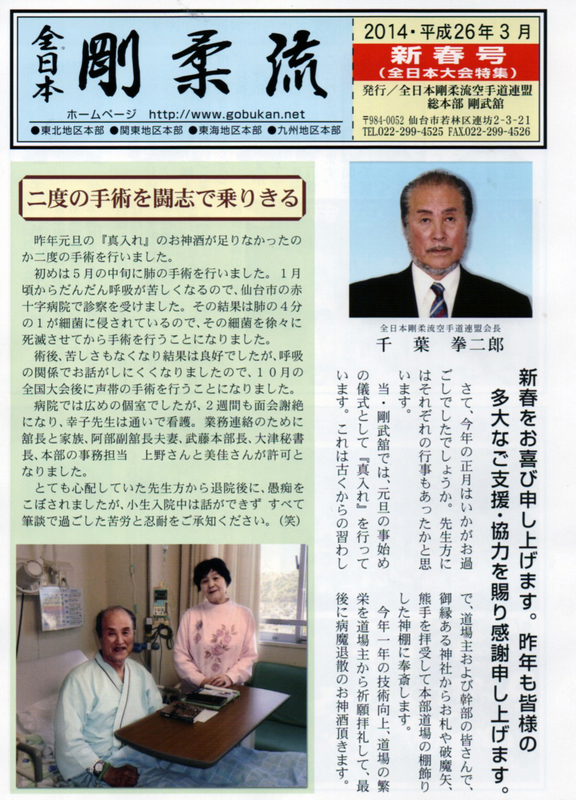 Taiani Sensei and the Ichikawa-ha Goju ryu International Sosui kai was very relieved to learn that Chiba Kenjiro Soke underwent successful surgery and is having a strong recovery. We wish Sensei and Mrs. Chiba the very best. 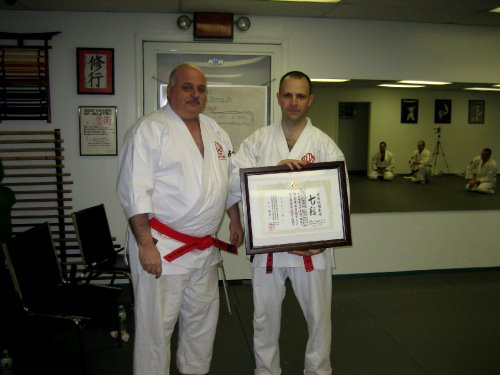 On December 4th, 2011 the Ichikawa-Ha Goju-ryu International Karate-do Sosui Kai held its quad-annual gasshuku at the Goshin-Kan dojo in Merrick, NY. 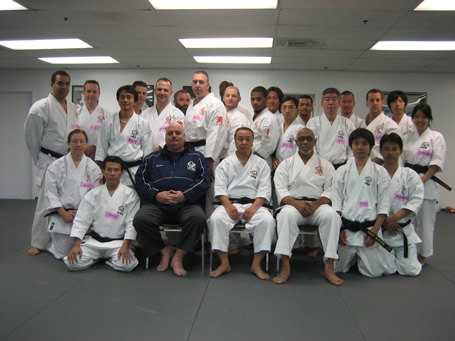 The gasshuku was conducted by R. Choji Taiani Sensei and included members of the Honbu dojo as well as participants from the Philadelphia branch. The goal of the gasshuku was bunkai of the kata Seisan. In the first segment of the kata, Taiani Sensei discussed the importance of “clearing” the man’s incoming technique away from the body by utilizing two hands, as opposed to the traditional, ‘one-hand one-strike’ counter methods. 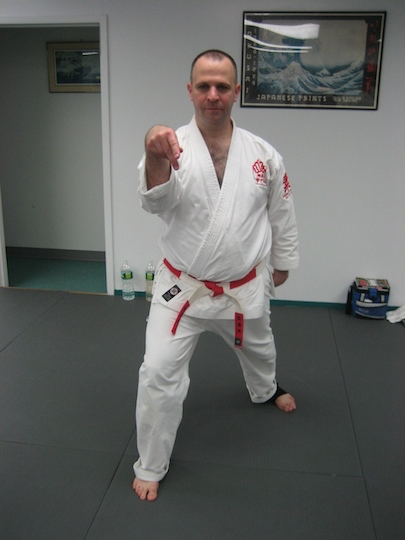 A major focus of the gasshuku and of Ichikawa-ha Goju-ryu specifically, is the “continuous fist” principle. Taiani Sensei demonstrated the continuous fist principle and showed how one technique can be used strike your opponent multiple times. This was just another segment of training where the participants realize that there is no substitute for practice. Taiani Sensei always teaches his students the importance of live practice. Every segment of demonstration was accompanied by plenty of time to see first-hand how the technique will work against an “unwilling” opponent. At the end of the bunkai segment for Seisan kata, Taiani Sensei had everyone then work on the kata itself in order to visualize the bunkai in the movements. Considering that Taiani Sensei gave us almost 6 hours of bunkai, visualization within the kata is also something we must all work on. 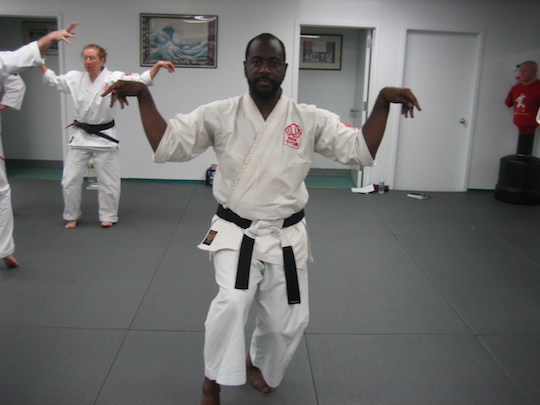 Khalid Newton Shihan performing Seisan Kata. Two of our members tested for grade at the winter gasshuku and satisfactorily passed. The Ichikawa-ha Goju-ryu International Sosuikai had its annual holiday party. Everyone had a wonderful time. 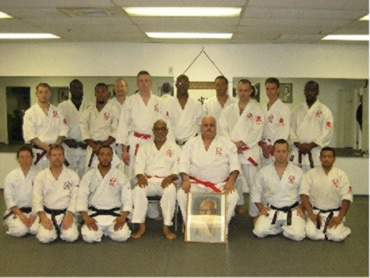 On September 25, 2011 the Ichikawa-Ha Goju-ryu International Karate-do Sosui Kai held its quad-annual gasshuku at the Goshin-Kan dojo in Merrick, NY. 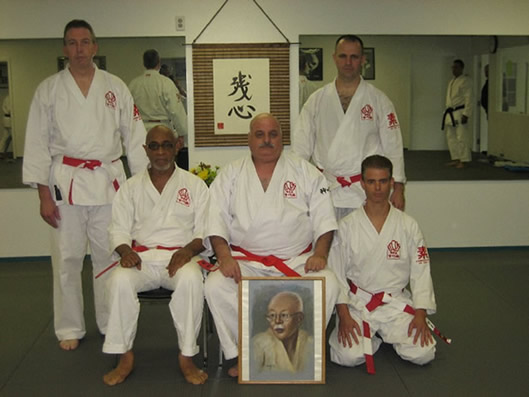 The gasshuku was conducted by R. Choji Taiani Sensei and included members of the Honbu dojo as well as participants from the Philadelphia branch. 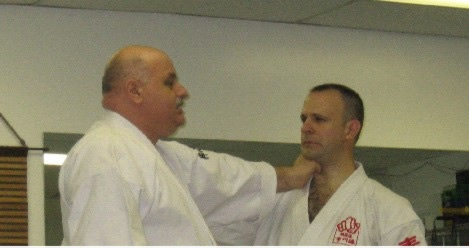 (right) R. Choji Taiani Sensei. Taiani Sensei opened the gasshuku by saying a few words about two important people who are no longer with us and then burning incense for their souls. Taiani Sensei also wanted all participants to understand that this gasshuku was dedicated to their memory. Yokoyama Sensei gained celebrity status in Japan as a national hero during his youth by defeating, in a full-contact bout, a Muay Thai champion from Thailand whose specific goal was to humiliate the Japanese in the ring. As history tells it, the outcome was slightly different than the promoters predicted with a little help from Goju-ryu. 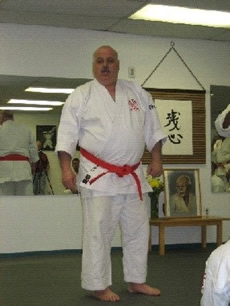 Yokoyama Sensei was best known by his peers in Goju-ryu by his performance of his signature kata Tensho. Because Tensho was so important to Yokoyama Sensei and became such an intricate part of his Karate, Ichikawa Sensei granted him special permission to create his own version of the kata, called “Dragon Tensho,” that he would perform in addition to Ichikawa Sensei’s. 2011 marks the 10th anniversary of the September 11th terrorist acts perpetrated against the United States in which almost 3,000 innocent people were murdered. 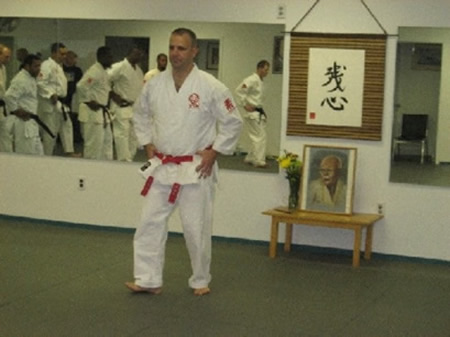 Among the people that were taken from us that horrible day was one of our dojo members and personal students of Taiani Sensei, Michael Mullan. 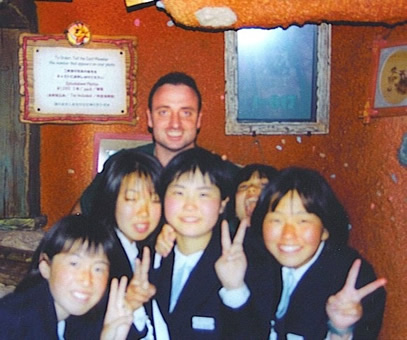 Michael Mullan will always be remembered by Taiani Sensei and all members of the organization, not only for his courageous acts on September 11th but for his lighthearted nature and ability to brighten everyone’s day. 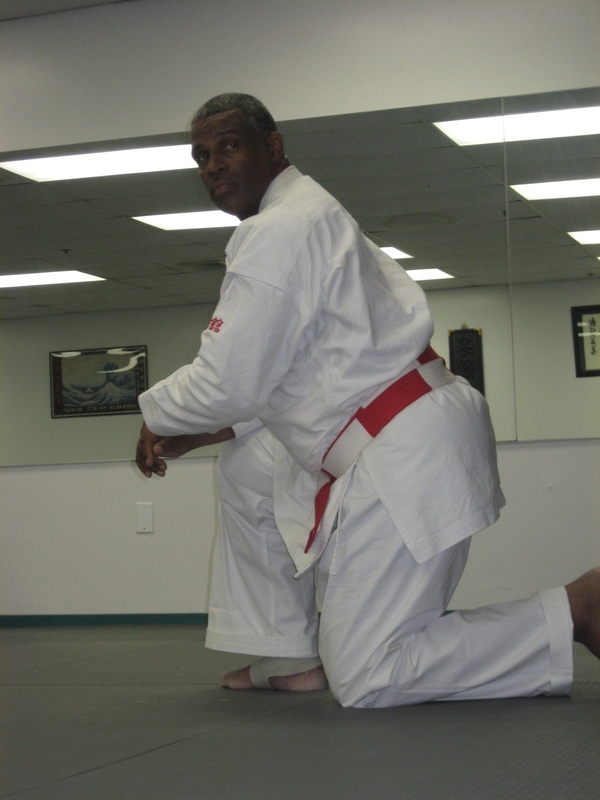 When gasshuku started, Taiani Sensei turned the floor over to his chief instructor, Christopher Lorentzen Sensei, who started everyone off with Damo Taiso exercises created to loosen up and prepare all for Karate-do training. After Damo Taiso, Taiani Sensei took the floor and in keeping with tradition, outlined the overall goals of gasshuku that we were looking to accomplish. 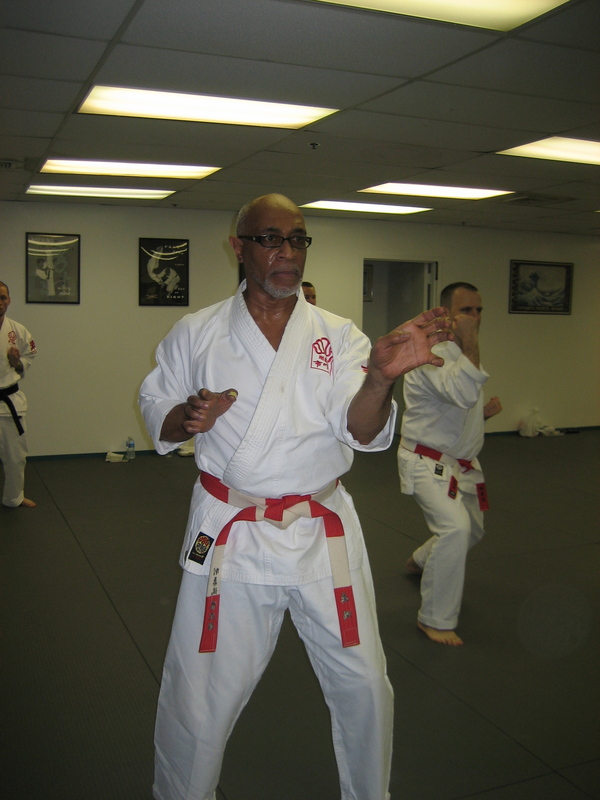 This particular time, Taiani Sensei thought it was important for us all to recognize the differences between traditional Goju-ryu and Orthodox Goju-ryu. He started by comparing and contrasting very simple kihon to make his point. One of the main focal points of this year’s fall gasshuku was for the class to gain an understanding of Shisochin kata. Taiani Sensei mentioned that he was going to take a very “old” approach in teaching everyone this kata which is much different than the norm. Taiani Sensei explained that the “old” way of learning kata was for the student to first be versed in all of the kihon contained therein. 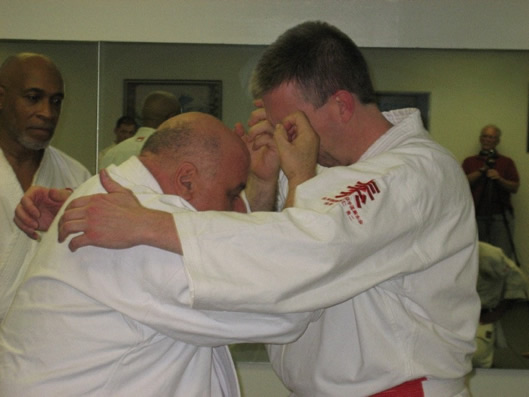 Then, the student would learn any bunkai associated with the kata. Finally, all of the components come together for a finished product to be practiced and polished. It didn’t take long into learning Shisochin to witness some of the devastating techniques that it possesses. 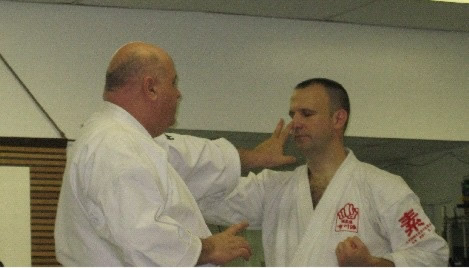 Opening strikes of Shisochin demonstrated by Taiani Sensei (left). 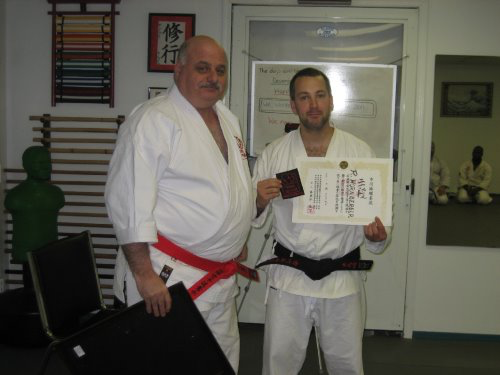 Lorentzen Sensei (right) hopes for the best. An example of this can be seen in the photo below with the application of tortoise technique. As usual, students were very surprised at how many grappling/grabbing techniques that are contained in Goju-ryu Karate-do kata. It’s certainly not all punching and kicking. 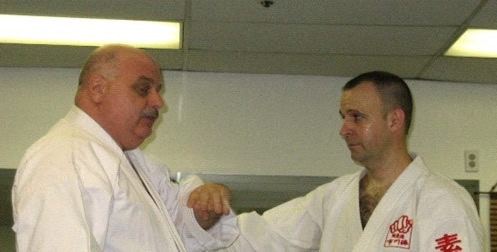 Taiani Sensei (left) demonstrates the tremendous amount of grappling techniques contained in Goju-ryu kata. 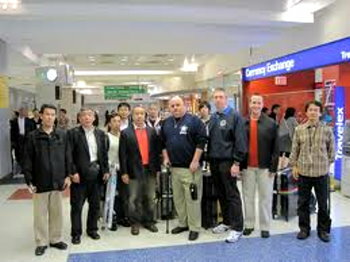 Shigaku-Kan Dojos First Visit to the U.S.A.
Taiani Sensei (middle right) greets Tsubamoto Sensei (middle left) and his Shigaku-Kan Dojo at JFK Int’l Airport. 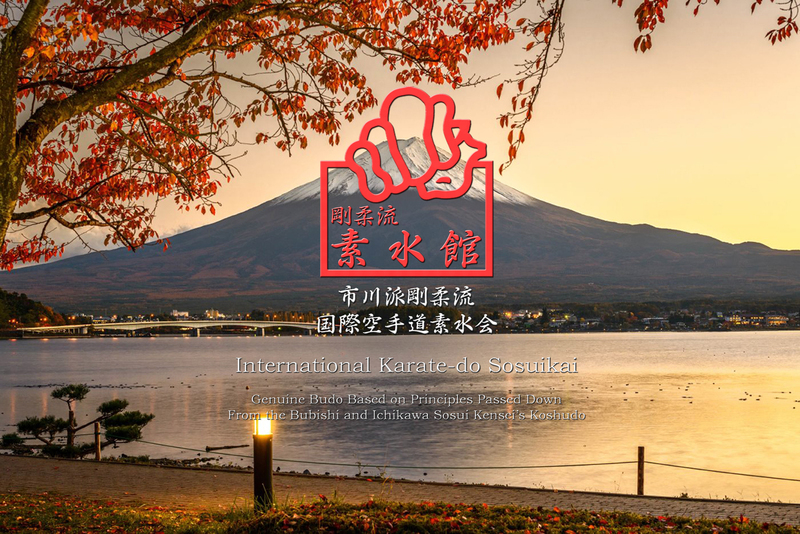 This event marks the Shigaku-Kan Dojo’s first visit to the U.S.
From October 8th – 11th, the Soto-Kan dojo of the Ichikawa-ha Goju-ryu International Karate-do Sosui-kai hosted our Japanese brethren of the Shugaku-kan Dojo for three days of training. The Shigaku-kan is headed by Tsubamoto Kazanobu Sensei, 9th Dan Hanshi and also the successor of the Ko Shu Do from Ichikawa Sosui O-Sensei. Tsubamoto Sensei was invited to the United States by R. Choji Taiani Sensei, 9th Dan Hanshi and custodian of Ichikawa O’sensei’s Bubishi and Ko Shu Do. Although Taiani Sensei and his Dojo have trained together with the Shigaku-Kan on different occasions, this event marks their first visit to the United States. 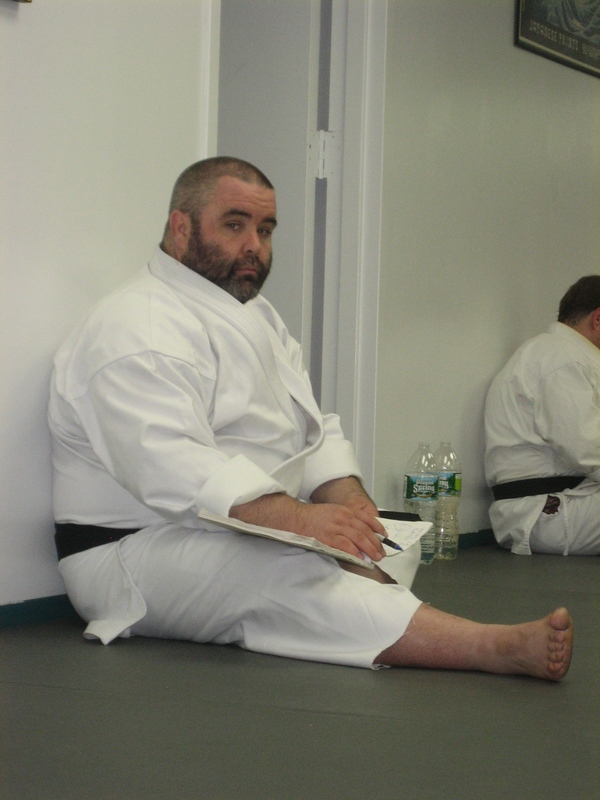 The training, which took place at the Goshin-kan Dojo in Merrick, N.Y., had several very specific focuses. Among them was Tsubamoto Sensei’s Da-Mo Taiso training. 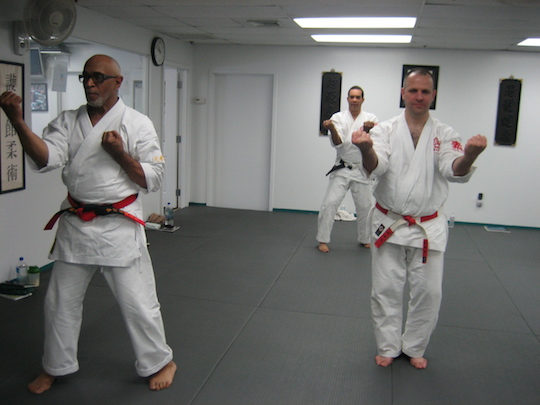 This version of Da-Mo Taiso, in addition to warming-up the body for the rigors Karate training also concentrates on strengthening the joints. Tsubamoto Sensei stated many times throughout the session the importance of this practice in order to fully grasp the mechanics of Ichikawa-ha Karate-do. 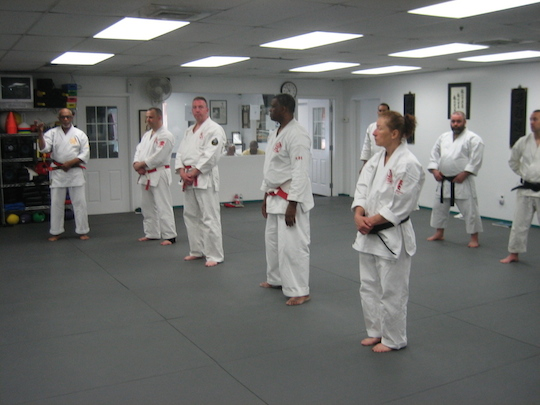 The second segment of the seminar was with the entire group practicing Shisochin Kata. It was evident during Tsubamoto Sensei’s demonstration how he emphasizes very deliberate mechanics of the Kata in order to accentuate proper structure and the techniques contained within the Kata. After practicing Shisochin several times with Tsubamoto Sensei as our guide, many of his senior students assisted the more junior students of the seminar in the finer points of executing parts of the Kata. Practicing some of the key takeaways of the kata session. 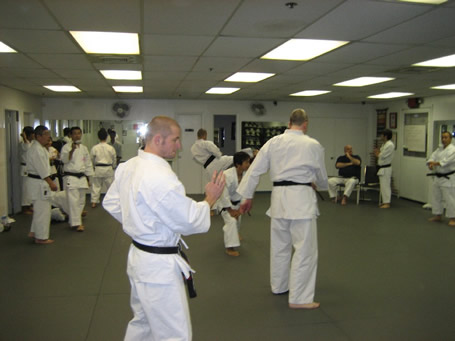 In addition to training in Shisochin Kata, there were also break-out sessions where each individual student had a chance to practice two other kata in addition to Shisochin. The two other kata were Seinchin and Saifa. Many of the senior students of Taiani Sensei enjoyed interacting with Tsubamoto Sensei’s senior students while comparing and contrasting various segments of the kata. After a day of rigorous training, all the participants from both Taiani Sensei’s Soto-Kan dojo and Tsubamoto Sensei’s Shigaku-Kan dojo took a few moments and got together for a group photo. 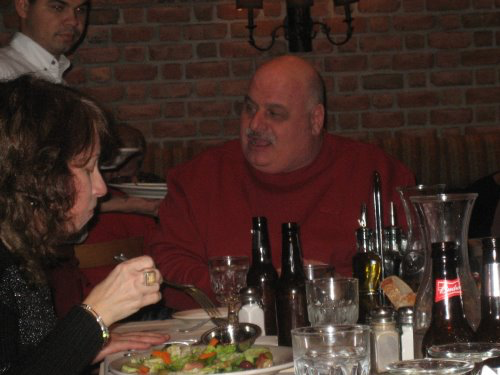 On Saturday the 9th both groups got together for a wonderful meal at a local steakhouse. 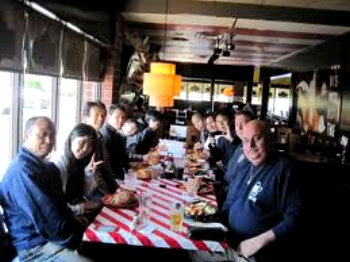 Although customary for Americans, our Japanese guests were amazed at the size of the portions. 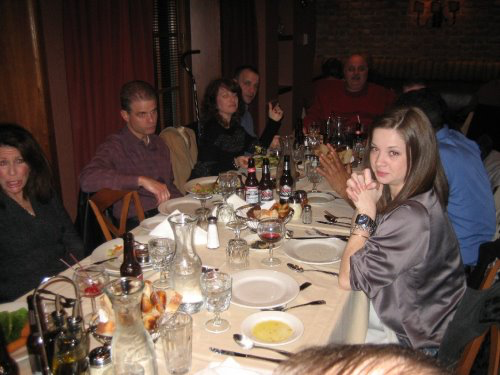 From the consensus, everyone truly enjoyed the meal as well as the company.